On Tuesday, New York became the first state since the Newtown shooting to pass significant common sense gun violence legislation. But don't worry New Yorkers, there's a place where you can keep your AK-47 next to your bed without dealing with pesky things like universal background checks. Where is this magical land? Texas, of course. 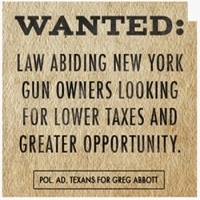 At least that's what Texas Attorney General Greg Abbott is telling New York residents with his new ad campaign. That's right Texans, you are all gun owners even if you didn't know it. According to The Daily Beast, the advertisement makes Texas look like the Wild West, referencing that there are no income taxes and "pliant labor laws" which means "extra money to buy more ammo." Texas is a true American state where "whimsical and knee jerk reaction by political leaders" do not overrule the Second Amendment, said Abbott spokesman Eric Bearse to The Daily Beast. Addressing a conservative policy group in Austin last week, Texas Governor Rick Perry said that "I'm sure that I couldn't get all 49 other governors to admit that they would want to be Texans,” and then, referencing Cuomo's support for gun control said, "I'm thinking that Gov. Cuomo would not admit that he'd want to be a Texan." "But if he were truthful," Perry added, "you could say that the economic climate that has allowed the state to grow and create jobs, he'd dearly love to be able to stand up and say, 'We did this in New York.' But he can't." No, Cuomo can't say that, but in the next few years or months or even days when another traggic shooting occurs somewhere, he can say that his government has taken action and has made a plan for New York citizens. Meanwhile in Texas, officials will be sure not to let a tragedy like 20 children dead after a shooting at their elementary school change how they view common sense gun violence measures. If Perry steps down from his throne in 2014, Abbott is expected to follow in his footsteps by running for governor and maybe even shooting a coyote or two on his morning jog.